When 2017 started I had already been girding my loins in preparation for a certain card game that was originally released in cardboard form back in 2007. Yes, 2017 was to be the year that I finally left my family behind and started the cult of Vlaada, continuously playing the digital version of Through the Ages. Things have changed. While I’m still planning on abandoning my family for a 2007 card game, it looks like it might be Race for the Galaxy instead of the aforementioned civ builder. RftG is out and, yes, it’s that good. Despite their vastly different themes, Race for the Galaxy can trace its lineage back to the fertile plantations of the venerable euro board game, Puerto Rico. Designer Tom Lehmann was tasked with creating a card game based on PR and several of his ideas eventually appeared in the Puerto Rico card game officially known as San Juan. He took the remainder of his ideas and dumped them into a sci-fi game with a 4X vibe that was eventually polished to a mirrored shine in Race for the Galaxy. Space Port. Your buyer of whoopee cushions and Groucho glasses. Race for the Galaxy predates Dominion by a year so, thankfully, it’s not a deck-builder. Instead, RftG is a classic card game in which you’ll play cards down in front of you while your enemies do the same. There’s very little in terms of interaction, which is one criticism often leveled at RftG. If you go into it knowing that each player is racing to build the best engine rather than blowing each other up with death rays, the gameplay fits perfectly. Cards have multiple roles depending on their location. They can be worlds you’ve settled or projects you’ve completed if played in your tableau, or they can represent raw materials that your planets produce. In your hand they act as money, used to pay the cost of building or settling. Wrapping your head around the card’s variable nature is a large part of overcoming RftG’s learning curve. The Rosetta Stone of RftG. The remainder of the learning curve involves deciphering a series of icons that even Champollion would have trouble unraveling. The cardboard RftG was notorious for scaring newbies away due to the lack of text and these intricate hieroglyphs. While the digital version still thrusts its icons front-and-center, a simple tap on each card reveals what the icon means in plain english, making the icons less of a hurdle. Once you play a few games with each icon explained, understanding the icons soon becomes second nature. Gameplay involves each player secretly selecting an action and then revealing them simultaneously. Only the actions selected by players will be performed that turn, but all players will get to perform said action with the player choosing it getting a benefit. For example, one action is “Development” and it allows you to build a development card from your hand. If I select Development but my opponents do not, we all get to perform the Development action but I get to build mine with a discount. There are five actions to choose from, and part of the fun is guessing what your opponent might pick. Really need to Settle, but also want to Trade? Maybe your opponent will pick one of those, allowing you to pull it off while selecting the other action you needed this turn. Other than that, it’s a Victory Point chase. VPs are gained by settling new planets either peacefully or via your military. You also get VPs from building developments which, apart from generating VPs, also usually give you benefits in one or more phases of the game. VPs can also be earned by generating and selling goods or by being the first to accomplish certain goals during a game (if you have the expansions…see below). While this all sounds like it plays like a 4X space romp, be aware that RftG is firmly set on the euro game side of the aisle. The theme is somewhat pasted on, and most of the game will have you focusing on your own hand and tableau and not even paying attention to what your opponents are doing. That’s not a knock, it’s just the kind of game RftG is. When did the galaxy get so damned crowded? Simply bringing the gameplay to life probably would have been enough, but Temple Gates‘ port of RftG goes the extra mile. The AI is crated by Keldon Jones who has been working on a neural net AI for RftG since soon after its release. After years of polishing and learning, the AI in RftG is about as perfect as you can get in a mobile title. The easy AI is just that, and should only be a threat to newcomers. The medium AI will give intermediate players a run, but they should still be able to compete and win some of the time. The hard AI is for the pros. I’ve had RftG on my shelf since 2007, have played it a bunch, and the hard AI has no problem showing me the door. It’s smart and will give good players a run for their money. On top of that, there is online multiplayer that can be played either in real-time or asynchronously. Multiplayer has been working perfectly during the beta with players assigned a “friend code” which they can share with others to be added to their friend lists. The only downside is that the friend code doesn’t seem to be the same between devices, so your games will not carry over between phone and tablet. Also, there doesn’t appear to be any indication for which players are currently online, so you’re never quite sure if your opponent is still taking their turn or logged off. Even if you don’t have any friends, you can always select a quick game option and be paired with randos from around the world. The tutorials are brought to you by Starfleet. Otherwise, the app is flawless. The UI is smart and intuitive, the graphics are sharp and, even on the smallest devices cards, can be tapped to zoom and see their details. 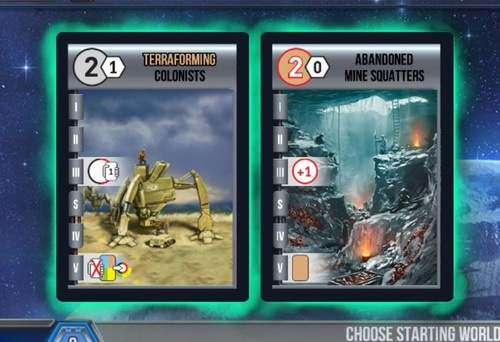 There are a series of three tutorials to get rookies up and running, and both The Gathering Storm and Rebels vs. Imperium expansions are available at launch for purchase, adding new mechanisms such as goals and takeovers. 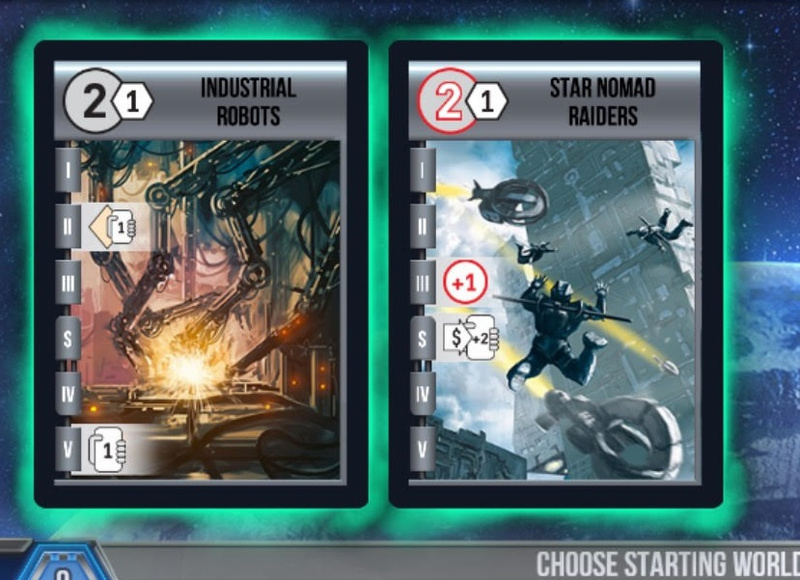 Even without the new mechanisms, you can simply add the cards from each expansion, increasing your options in each game. 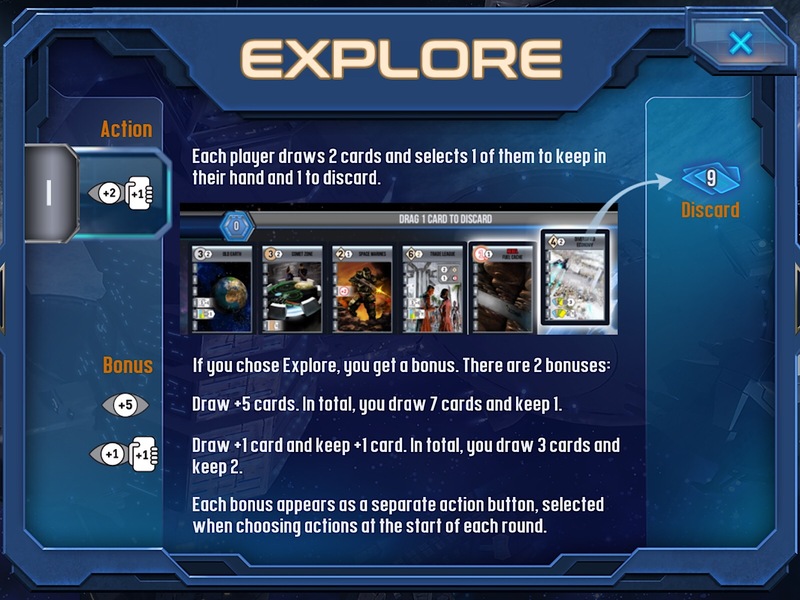 Apart from adding in expansion content, you also have the choice to play 2-player games with the standard rules or the advanced 2-player rules in which players get to choose 2 actions per turn. 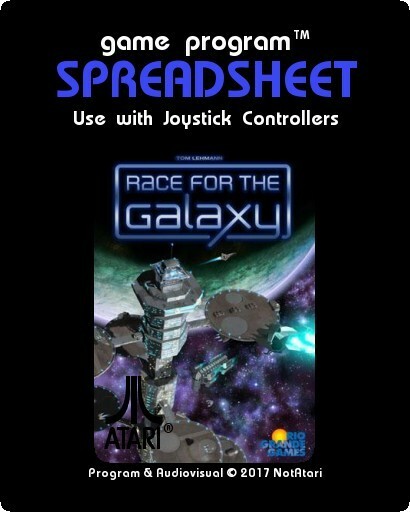 Race for the Galaxy was one of the games gobbled up by Goko back when that debacle was news, and it seemed unlikely that a mobile version would ever make it to the App Store. Yet, here we are with a brilliant version of RftG on our devices courtesy of a developer that most of us had never heard of. Here’s hoping that Temple Gates has more board game wonders in store for us in the future. They’re too good at this for RftG to be their only cardboard port on the App Store. Agreed - this is a fantastic port. Really glad they made the decision to include async play when a solid argument could be made for it being sync only. So this “friend code” thing. Is that something you need to do once per game? Or once you’re friends, you’re friends? Just only on the one device (so far)? Just once, at least in the beta. Just once. It’s tied to the device, not an account. Thus, you’ll have different ones for your tablet and phone meaning you can’t start a game on one device and finish on another. That said, the developers have said that they’ll be making online games sync as well as adding stats and more in about a month. Race for the Galaxy predates Dominion by a year so, thankfully, it’s not a deck-builder. That’s supposed to say “unfortunately”, right? I started a thread for friend codes… Give it a day or three and maybe a tourney? edit: did they fix the app badges? edit2: it appears there are no notifications at all right now - the app didn’t ask for permissions and I don’t see it in the notifications list. I tried the tutorial as I always like to know how well the app will or will not teach my friends to play; I personally think is is pretty bad as far as tutorials go. Fortunately the game isn’t that complex and having the icons explained in game really cuts down on the learning curve. Anyone try to play this yet that was not already familiar with it? I played the beta without knowing the game at all before hand. I found the tutorial mostly enlightening. There were a couple of concepts that made me scratch my head, but I refered to the pdf rulebook which helped. After a game against the easy ai I felt pretty comfortable with the basic rules. I’m in the same boat as Snotty–played the beta as a complete newbie and learned as I went from both playing the game and reading the rules. I even somehow managed a win against the hard AI at one point. I’ve seen the game described as “Puerto Rico in space,” which might help one grasp the basic idea, although I find RftG much more interesting so far. Them patching the server is super slick. I can still start a New Game, with Online Games greyed out and a notification “Patch in progress” under the profile. I’m new to RftG. When I start a game there is an option for expansions. I haven’t bought any but there is a button for NW. What is NW? It can be highlighted or not. It adds in six additional starting worlds… I’m trying to find a link showing them. Doesn’t change the mechanics or rules of the game at all though. And an update too. I’m already really happy with my purchase, and this is getting even better! Glad they added the notifications and Next Game button! What @js619 said. I wanted to add, however, that if you want to expand your game and can only afford one, pick up Gathering Storm and play with Goals. I find them to be a fantastic addition to the game. I’m less excited about the RvI expansion. I have it for the new cards/goals it offers, but I’m not a huge fan of the “takeover” mechanism it added. Luckily, you can turn off takeovers and just play with the new cards which is nice, but not as essential as getting the goals with the Gathering Storm expansion. Me too…now take your turn! We’ve had a game waiting since the beta! We do? It made me uninstall the beta when I installed the retail version… gah… Send me / post your friend code, let’s start a new game. Send me / post your friend code, let’s start a new game. Added it to the RftG friend code thread. Created a game for us as well. Doesn’t appear as if you can see more than 6 friends… or am I missing something? Tap the little arrow on the right side of the box. “San Juan in space” is even closer. if you want to expand your game and can only afford one, pick up Gathering Storm and play with Goals. Actually the choice is made for you. Trying to buy RvI brings up a screen saying that owning GS is mandatory. I will probably pick it up, though something turns me off about it, I can’t say what. I bounce off most games I play pretty hard, even when they are good (e.g. I won the first game of Ghost Stories I ever played, then didn’t play again). I would like a nice play video, though I doubt it would be that entertaining to watch. It’s probably that it starts out (for most players) as multiplayer solitaire. It’s so easy to laser-focus on your set-up, and to feel like there’s nothing you can do about the other guy, that it seems like you’re actually playing a solo game. It’s a fair complaint, but things usually start to get better when you gain enough experience to really examine the other guy’s set-up and start screwing him/her over as much as possible. Or … it could be that you think the game sometimes plays itself. Which, honestly, isn’t that unfair. Nah, it’s not that, at least for me. It’s probably the choice of action. I’m not big on choosing a role each turn as a mechanic. This isn’t exactly like that, but somewhat. The nearest thing I’ve played is Le Havre, which I bounced off so hard I left a crater and a mass dinosaur extinction. Might give RftG a go though, given the enthusiasm. I am also not sure I’d like to take the risk of buying the game. The games mentioned to compare RftG with (San Juan, Puerto Rico, Le Havre) aren’t games I enjoy. Too Euro for my taste, too much “Spreadsheet”, too complex to be enjoyable for me. Nevertheless I’m very happy about a good boardgame port, especially from a new developer. I hope they have enough success with it to make more. I just wanted to say that this game is great. I like San Juan, which this has been compared to, better than Puerto Rico. This game just adds so many additional strategies and goals it is fun to play the variations. I’ve not had an opportunity to play a military strategy, yet. Hopefully I’ll have a hand that provides that opportunity. And someday I’ll decide to play the hard AI. I like the two player expert option to choose two actions each turn. I feel I’m able to link actions together to get more done. I can see where the expansions add a lot, and have played them a little with Stately Players that have them. I’ve not bought the expansions yet, but they are on the radar. So what’s everybody’s favourite player count? I know one or two people who prefer 2-player only. What about others? I’d like to start some other games but would like to keep a good player count to keep people happy. The games mentioned to compare RftG with (San Juan, Puerto Rico, Le Havre) aren’t games I enjoy. FWIW, I don’t think it’s much like Le Havre. Then again, I loathe Le Havre with the heat of a thousand suns, so maybe I’m more biased than I realize. San Juan, yes. Very similar. Not a big surprise, considering the design history of both games. I like 3 player better than 2. But I will play 2 player (advanced) no problem. For some reasons I skipped it when it first came out because I’m not too fond of euro games (especially with hidden VP, but doesn’t seem the point here) but I LOVE card games and scifi. I’m pretty full of card games at the moment and I’m still playing and loving Age of Rivals like mad…but I saw a video of this game the other day and was really intrigued…turns seem fast but there is depth and I like a lot the general look. Are my worries misplaced and should I buy it immediately? (My fav card games at the moment, for reference, are: Age of Rivals, Star Realms, Magic Duels, Card Thief, Miracle Merchant beta, in no particular order). 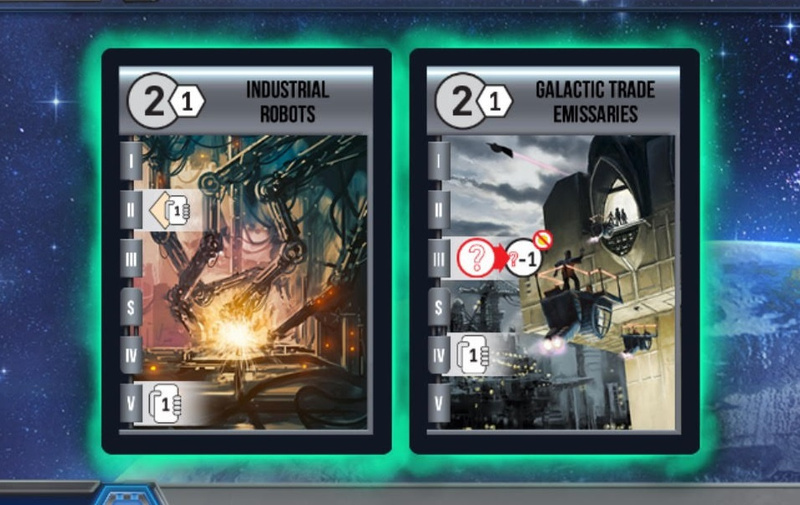 I’d compare RftG more to a Puerto Rico or San Juan type game, just with a sci-fi theme, in that the cards are both used for tableau building and as currency. The vanilla game was (rightly) criticized as being a little bland and multiplayer solitaire’ish, but with the expansions it really opens up. There’s a lot of interplay between cards, different victory paths, and the app is very well done. My one complaint about the game is that you can get unlucky in your draws and end up with cards that do nothing for each other, but that can be said of any game of this type. Never played Puerto Rico or San Juan (never been attracted by the themes) so those do little for me. I like you can decide with a glance (a long one, mind you) to your hand, generally I REALLY like games like those (Elder Sign is probably my favorite digital boardgame ever). I don’t mind luck too. Hmmmmmmm…I’ll wait tonight if anything massive comes up, then I’ll buy it. Thanks everyone…diving into the tutorial as we speak. Liking what I’ve seen so far. Did the tutorial and played a game against the easy AI. Really really liking the game…my worries were totally misplaced. The theme does everything for me and so far I got very distinctive games…with stories on my mind going from a diplomatic production Star Trek approach to a destroy and conquer everything one. I’ll play a bit the vanilla game but I’m already planning to buy the expansions. Tons of options but turns go fast…can’t wait to dive in multiplayer and surely be trounced by you all. Which friend code should I use? iPad or iPhone? I linked the devices but unless I’m dumb I see two different ones (I guess it’s for proper notifications). Just a question for those of you with some games under the belt: do you prefer to use the “advanced” two-player rules? Tom Vasel over at the Dice Tower seems to swear by them, but I’m not getting the hype. With the two-action variant, I feel like too much can happen in one turn and it really takes away from the tougher decision-making when you can only take one action, and it might just be what your opponent(s) pick. I prefer the advanced variant, personally. Without it I feel like I can’t really develop / implement strategy before the tableau is filled up. I feel like too much can happen in one turn and it really takes away from the tougher decision-making when you can only take one action, and it might just be what your opponent(s) pick. I like the advanced rules because they allow me to link actions together. Otherwise the game seems sluggish with only two actions each turn. I have a question about the advanced rules. If your two actions are both the “I” action, 5 cards keep one, and 3 cards keep 2. The game combines them and gives me 8 cards (IIRC), but I can only keep 2. It seems that I should be getting 8 cards and keeping 3. Should it not be combining the two actions, should I be getting 3 cards? Or is this dealt with in the rules. That’s just a game rule. No mistake in the app. I wasn’t thinking of them as bonuses. Thanks everyone for the explanation. Thanks for everyone nudging me into buying the game. Possibile my CGOTY already. (Card Game of the Year). In a really crowded space with many awesome entries, I must add. Looking forward to be trounced in MP by you all. Will probably buy expansions soon. As I am on the fence as well, how long does it take to learn the game and be able to enjoy it? From 1 (very fast) to 10 (very long). I would say a 2 or 3 at best too. Some things weren’t super clear to me after the tutorial…but 5 games in everything was natural, beat easily the easy AI and now moved to the normal one (which trounces me). It’s way easier at first to play military worlds imho. Everything has clear tootips but I’ve noticed that after a while I can discern and understand the general meaning of icons and position at a glance. At first I found super handy the fact you can zoom in a card and then swiping you move to the next/previous one to read and decide what to keep/what to deploy (this should be standard behavior on ALL card games on iOS but sadly it isn’t). The real life game must be a real nightmare tough. It’s a fantastic app, which is the important part for me. Because RftG is Exhibit A for games I would never play in person. I’d put my fist through the back of some neckbeard’s skull, for sure.